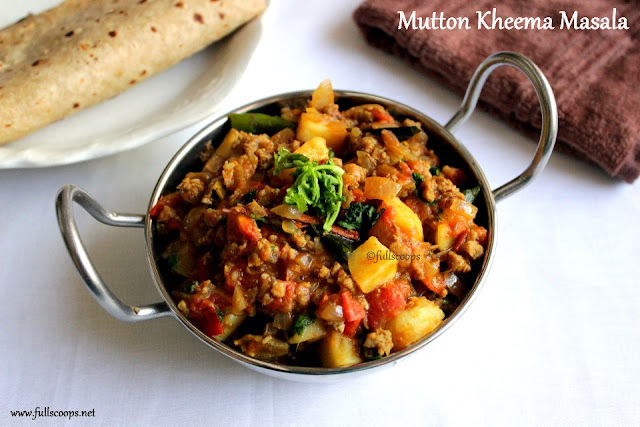 Mutton Kheema Masala / Lamb Minced Meat Masala ~ Full Scoops - A food blog with easy,simple & tasty recipes! 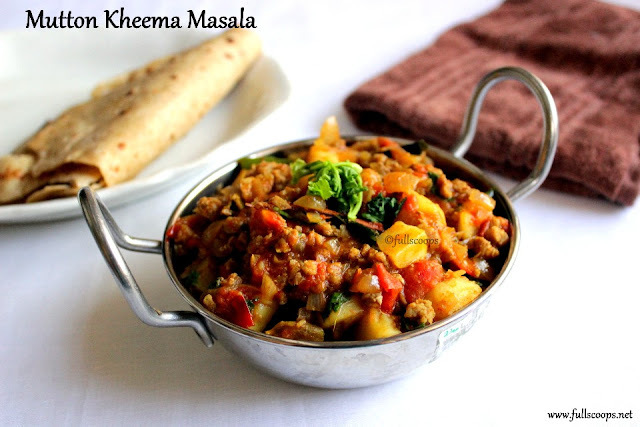 Kheema masala or minced meat masala can be made with any meat. 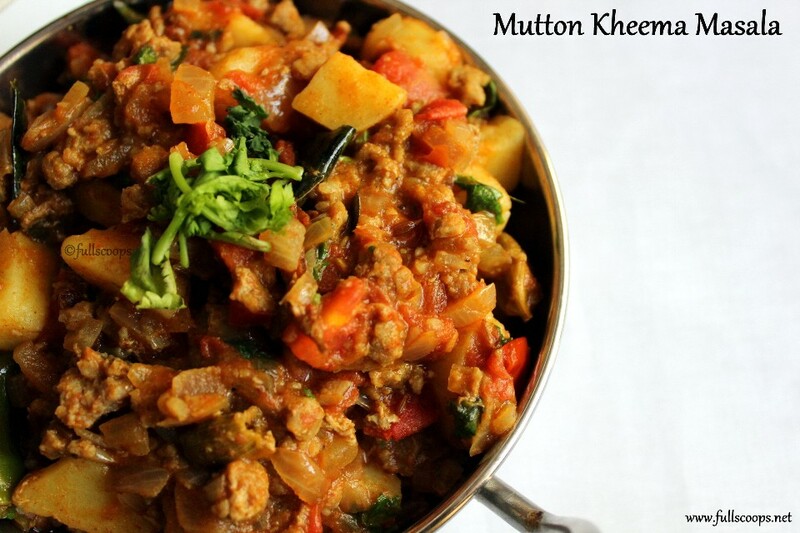 I have used mutton but you can make the same delicious masala with any meat you prefer. 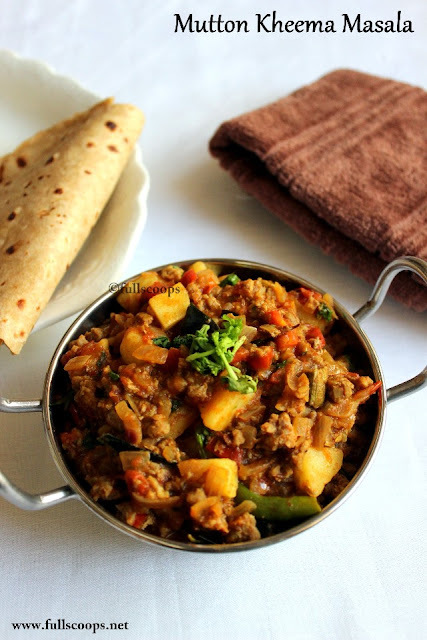 Tastes really good and goes well with with roti, paratha or even dosa. This is the way we make but you can add more spices if you prefer. Either way this makes one yummy dish! 1. In a pressure cooker, add the washed and clean meat along with the washed potatoes. Keep for about 5-6 whistles or until the meat is well cooked. If you don't have a pressure cooker, you can cook directly in the pan. 2. In a pan, add oil. Once the oil heats up, add the cinnamon, clove, cardamon, fennel, cumin seeds, star anise and bay leaf. 3. Add the chopped onions and curry leaves. Add a little salt which will help the onions cook faster. 4. When the onions turn translucent add the ginger garlic paste. Saute until the raw smell if ginger and garlic leaves. 5. Add the chopped tomatoes. Wait for the tomatoes to cook until mushy. 6. Now add all the masalas, turmeric powder, coriander powder, garam masala powder, cumin powder and red chilli powder. 7. Add little water and mix the masalas well. Allow to cook for a couple of minutes. 8. Now add the cooked minced meat along with the remaining water. Mix everything together. (If you have not pre cooked the meat in pressure cooker,then add the raw washed meat and potatoes at this stage, add enough water and close the lid and allow the meat to cook till tender). 9. Once done, add the potatoes and mix along with the masala. Check for salt. 10. Add water according to the consistency of the gravy you prefer and switch off accordingly. If you've pressure cooked the meat and potaotes, you don't need to keep for long since it's cooked already. Just wait for the masalas to blend with the meat. 11. Add chopped coriander leaves and switch off. 1. You can completely leave out the vegetables or add any vegetable of your choice. Potatoes is not important. 2. You can skip the red chilli powder and use 2 green chilli instead. Kheema masala looks too yummy.. I'm hungry looking at the pic. Yummy...a variety recipe...would love to taste..
One dish ever classic and ever loved.